Readers will know by now that the “EU agrees to another extension”, to quote the BBC’s headline today. Quite extraordinarily, the Prime Minister has agreed to stringent conditions from the EU, completely constraining it from voting the way it wants to on all EU business. The above has the effect of removing the UK’s effective decision-making powers to act in its own interests. We believe this to be completely unlawful under the Treaties. That said, this has never stopped the EU before. A legal decision of Council, as expressed last night, will trump the Treaties from a political standpoint based on our experience of the EU, no matter the legal position. The above stops the UK from undertaking any “unilateral commitment, statement or other act by the United Kingdom” which goes against “the letter and the spirit” of the Withdrawal Agreement. Words fail us. A key aspect of this appalling deal is whether the UK can exit the EU earlier than 31 October. The only condition of exit in the EU’s Legal Act is if the UK ratifies the Withdrawal Agreement. There is no mention of the UK being able to exit the EU before 31 October on any other basis, other than it exiting automatically if it fails to hold elections to the EU Parliament. This, however, is something which the Government put in place by law yesterday. What if the UK Parliament finally decides to honour the Referendum result and wishes to exit on WTO terms? 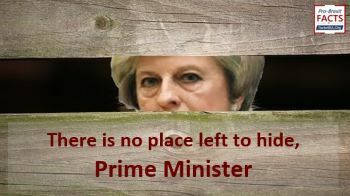 This is not allowed for in the agreement to which Mrs May has signed us up. And she has signed it – see below. Equally extraordinarily, Mrs May has already committed the UK to her late night agreement in Brussels. In the early hours of this morning, the UK’s Ambassador to the EU delivered a letter to the EU Council, accepting this appalling surrender. In effect, Theresa May has already committed the UK, using prerogative powers. You can read this letter here. It matters not what MPs might have to say about this. The evil deed is done. Why did she have to do this in the early hours of the morning? IMPORTANT NOTE: We are not lawyers, even though we have some significant experience of reading the EU’s legal or quasi-legal announcements over several years. We have sought legal clarification from Lawyers for Britain and from other Counsel, and are awaiting their opinion on what we have written above. We will revise if necessary, although we don’t expect that we will have to. We have criticised Mrs May from the start of her campaign to become Prime Minister – something which initially lost us a lot of readers. Fortunately many came back as our concerns were borne out by her actions. Today we must go one step further. We believe her to be mentally unfit to govern. Either the BBC’s Europe Editor is incompetent, or she is deliberately misleading the British public. For her to state that “there is no evidence of the punitive safeguards mooted to ensure the UK ‘behaves itself’ – refraining from blocking EU decisions – as long as it remains a club member” – is demonstrably wrong. It seems Ms Adler completely failed to look at the important document – the Legal Act. Any responsible journalist covering the EU knows that it’s what is in the legal texts that matters. 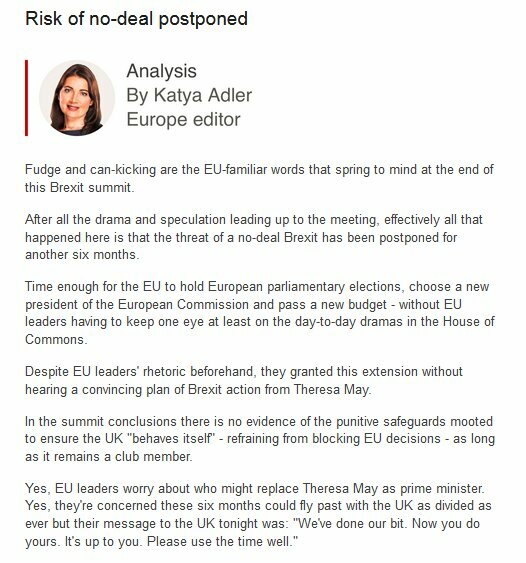 If she didn’t see that text when she wrote her piece, she should have refrained from commenting, knowing full well that constraints on the UK were highly likely. The BBC is wrong on a fundamental point regarding the future of our country. So wrong that we are forced to ask why on earth this organisation should continue to extract money each year (under legal powers) from the British people. Finally, if you value the information we have given you above, please donate to keep us informing you like this.